At Bishop Justus we have a full and varied programme to challenge our most academically able. The opportunities range from guidance on university taster experiences to Thinking Groups and Challenge projects – as well as seminars for students and for parents. 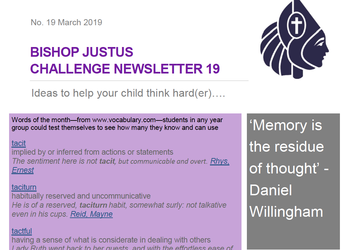 Student and parents will receive our newsletter twice a half term, sharing ideas to challenge our students, from vocabulary to puzzles, television viewing to university short courses. Year 7, 8 and 9 Thinking Groups are challenged each year with a ‘big’ question, deliberately chosen from those used at interview for Oxford and Cambridge Universities to test the way that candidates solve problems. Our students work in teams of three or four - with access to tutors and mentors - to research and then present their ideas on these topics. Question areas change each year, ranging from Mathematics to Politics, Philosophy & Economics. Year 10s are guided in writing their own questions, and have progressed to exploring them through the medium of the essay. Bishop Justus puts on events through the year to ensure that our students and parents are aware of the key issues and challenges facing them as potentially high-achieving academics. Our student seminars address mindset, learning habits and the opportunities for students post-16 and post-18. Our parent seminar helps by sharing the latest in the education landscape and providing a forum for parents to share experiences about helping their children to unlock potential. Thinking groups aim to develop students' cultural capital, thinking and research skills, and willingness and ability to reflect on the bigger questions that exist behind and between subjects. They meet at least fortnightly, and incorporate consideration and memorisation of some of the best that has been written and said, discussions of Politics and Philosophy, and general knowledge and problem solving activities. Thinking groups run in all year groups, in years 7 and 8 on the basis of prior attainment and in years 9-11 for higher set students after an application. Miss Arscott would be pleased to hear from students of any age who would like to join. Many universities, including those in the national top 20, run schemes for higher-attaining students of all ages where they can study at a high level and get an idea of university life. Many of these have to be applied for and there are more people who want to be involved than there are places, but they are fantastic opportunities. Priority is often given to students who meet specific criteria, such as being in receipt of ‘Pupil Premium’ or whose parents did not go to university, but we would encourage any interested student to make an application. Miss Arscott will aim to let relevant students know, but please see her if you find a scheme that you would like to apply for. There are also essay-writing competitions, every year, usually for students in year 12 - see below for a selection of links. Questions are usually published in the Autumn, with deadlines in the Spring. Please see Miss Arscott if you would like to enter.